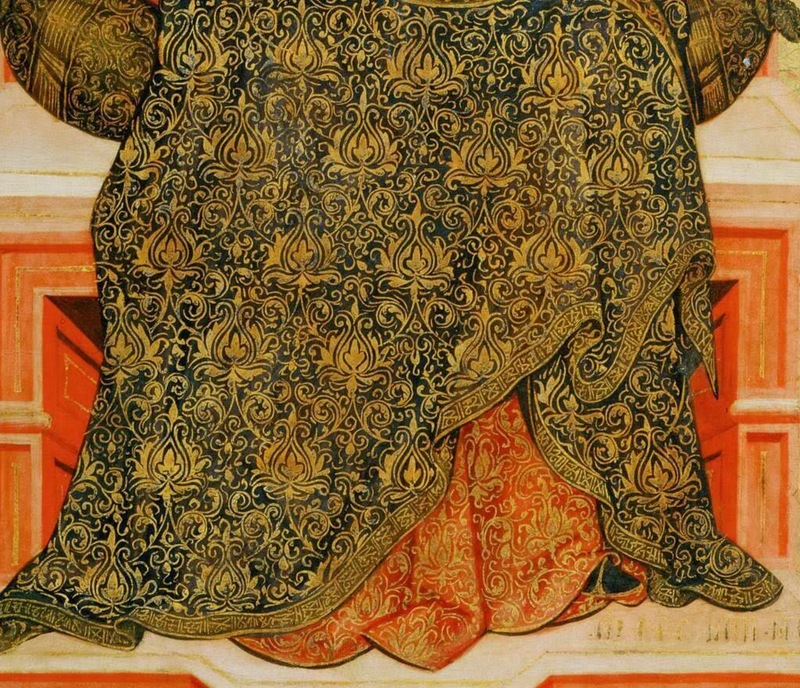 Have you ever noticed decorative borders in certain Byzantine or Renaissance paintings that don't seem to make any sense? 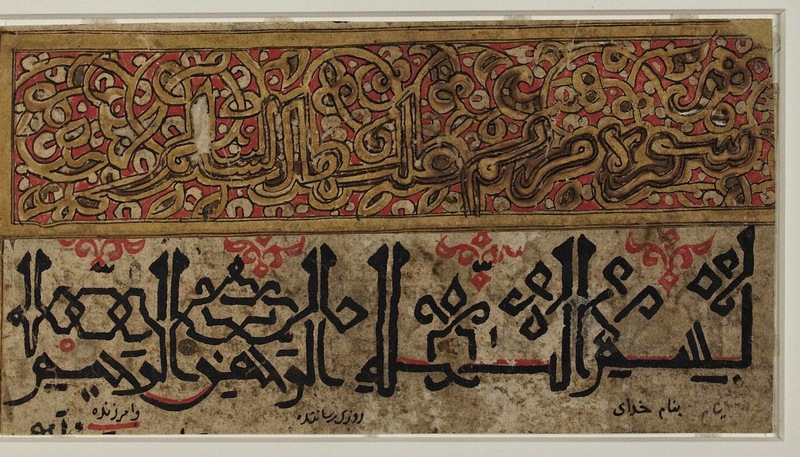 Beautiful, calligraphic, gibberish... ? 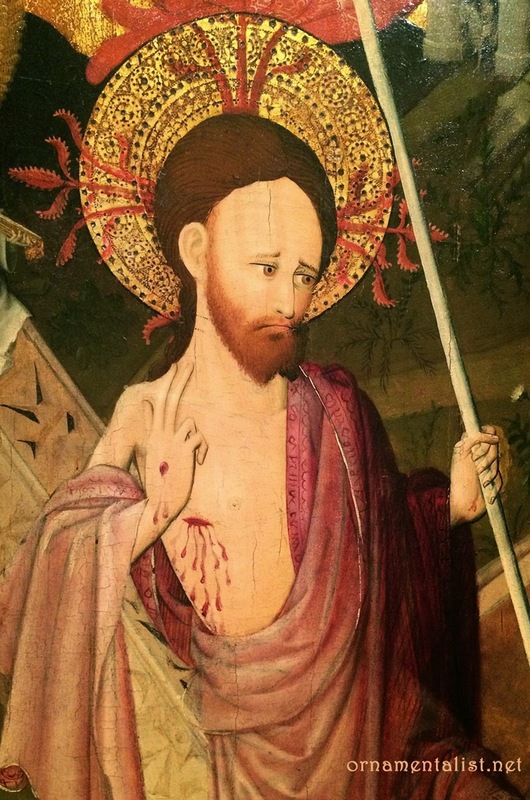 Last week I was visiting the Legion of Honor with my good friend and fellow decorative artist, Bruce Thalman, and I was studying some embossed, gilt halos in Medieval and Early Renaissance paintings, as I am wont to do, when I noticed something in the border of a cloak worn by the figure of Jesus in an anonymous panel from the 15th century. "Pseudo-Kufic" I said. 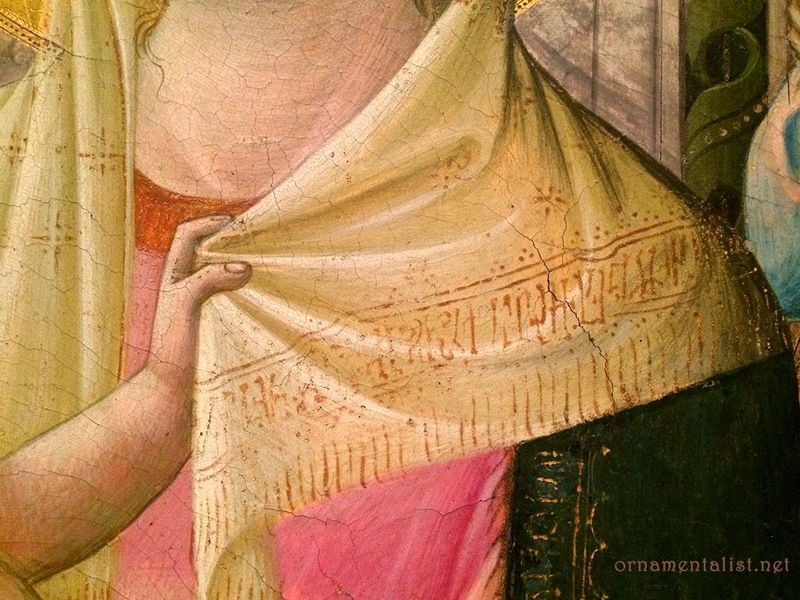 A great number of paintings of the late Byzantine and Early Renaissance era used a similar design device: arabesque lettering, painted as the embroidered decoration in the hems of garments or edges of carpets. This script is known as Pseudo-Kufic. Influenced by exotic artifacts brought back from the Middle East through both conflict and trade with the Ottoman Empire, Early Renaissance painters embellished their work with complicated patterns and eastern-style scripts in an effort to create an "oriental" atmosphere, especially with regard to persons or scenes from the Holy Land. Eastern Kufic script was a particularly ornamental style of calligraphy dating from the 11th century, whose design lent itself well to borders. There are many famous examples by Giotto, Massaccio, Gentile di Fabriano, and others who used Psuedo-Kufic, faux Arabic, Phags-pa Mongol script, and even faux Hebrew lettering in gold, to emphasize the rich, exotic impression of the Eastern world. (I find it this an extremely attractive era in art history.) It may have been a statement about the cultural universality of the Christian faith; a reverence for history in general; or possibly the ambitions of the church at that time. I recall an afternoon at the Accademia in Florence where I spent about 20 minutes discussing this decorative lettering with Erling, who has an interest in languages as well as cyphers. It's not like I can read Arabic or Hebrew myself, but I could tell this wasn't a real language somehow. Nevertheless I was trying to figure out if there was a pattern, and wondering if Giotto had invented his own alphabet, or whether each artist had a code worked into their own singular version of this calligraphy. And if so, could I decipher it? The following day, several hours in Hall 2 of the Uffizi, turned this into a minor obsession. I still notice it all over the place. 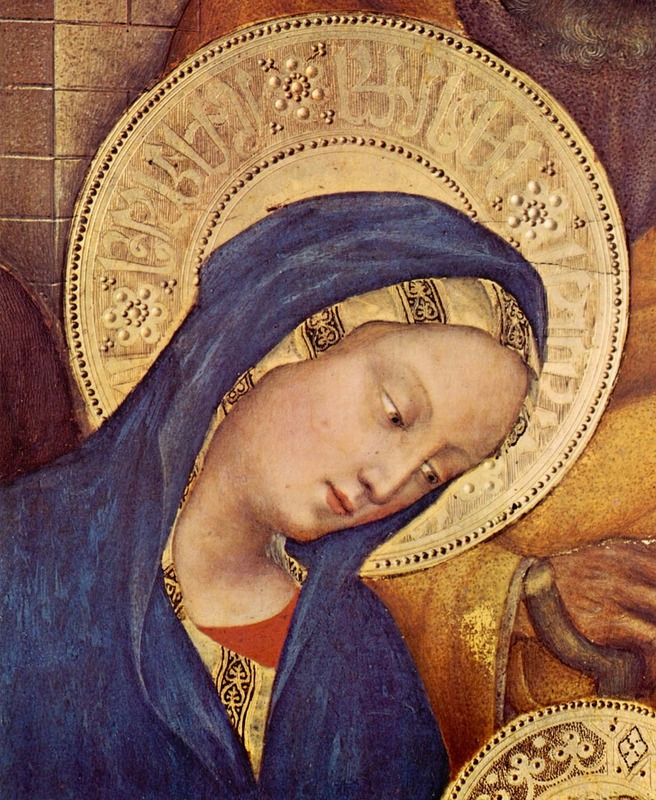 Paolo Veneziano: Virgin and Child (detail) 1354, Louvre Museum. Psuedo-Kufic hem embellishes a rich, oriental fabric. 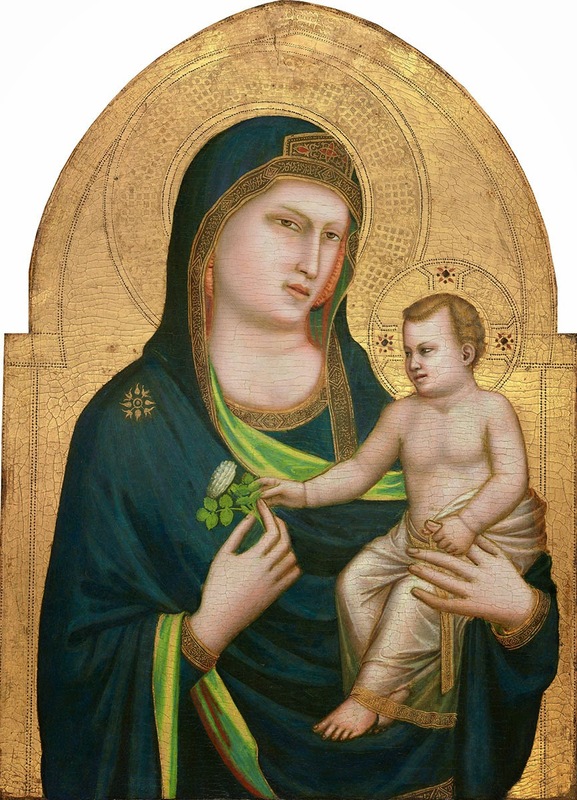 By the 16th century, orientalism in religious artwork all but disappeared, as the Italian churches wanted to emphasize a more Roman context to their history. Lynne, I remember when I was repairing a Greek icon that had split down the middle...and lost some of it's lettering on the scroll the saint was holding. It became one of those delicious down the rabbit hole searches....first to the Russian Orthodox church here in Seattle, and then to the head of the special acquisitions in the Seattle Public Library. The head, a very formal older gentleman in a 3 piece bespoke suit, took one look and told me the name of the saint (St. Martin) and the language (an ancient Baltic dialect) from the 13th century. I was so thrilled I almost fainted. Just to connect with such history and to speak with a person of such learning! Aren't we lucky to have a profession (and the accompanying obsessions) where we encounter this? I have never heard about psuedo-Kufic, and now I will look for it myself...thanks for adding another pointed arrow to my obsession quiver. Was the ancient Balkan language in your icon Glagolitsa by any chance? When we visited a tiny chapel in Hrastovlje (now in Slovenia) there was some graffiti on the wall and Erling said "oh hey, it's Glagolitsa, cool" I have long since stopped wondering how he knows stuff like that. Well, if I didn't have enough obsessions, you bring this one along! I had no idea! This is very fascinating, I will be squinting now over all the museum photos I have of gilded halos. Thanks for a wonderful post. in the past when I have had a commission to paint something that was to include some non-Latin script, or even non-English text, I made sure I understood what it meant and asked for expert assistance so I wasn't accidentally painting something nonsensical or offensive. But there is part of me that would love to reference this old tradition of using an invented and purely decorative language. This is absolutely fascinating, Lynne. Unlike you, I've looked at these scripts and thought all along that they said something I just wasn't privy to. And now that you've explained it, it's all so clear. Wouldn't it be fun to invent one's own script!! Thanks for the inspiration! I don't actually know what this one says! oh yeah RETNA does some cool stuff. That's like a graffiti-typography look- actually means something --although I admit I cannot read it, or most graffiti! Or for that matter a lot of calligraphy is so stylized it's illegible but you at least recognize a language-like pattern. I have read somewhere that in there is as well "Pseudo-Kufic" in one of Masaccios painting. To be more precise in the helo of Maria. Anybody has more information about it? 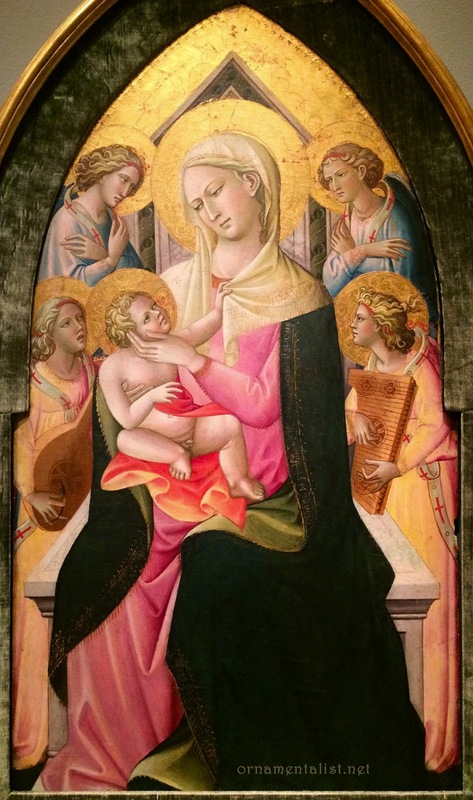 Hello Anon-- Masaccio's 1423 "Madonna and Child" altarpiece for the Church of Santa Maria del Carmine in Pisa, has a psuedo-arabic script embossed into the halo around Mary's head. It is for the same reasons as stated above. 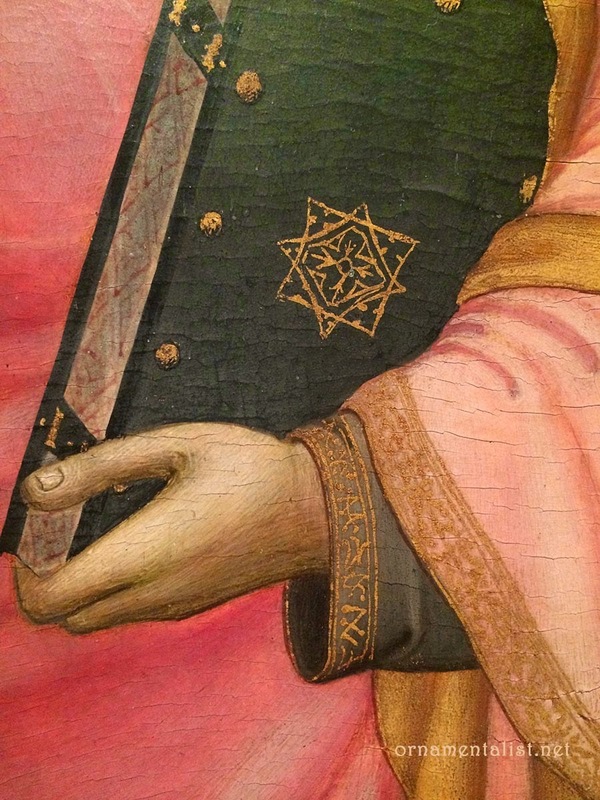 There are hundreds or thousands of examples of this in kufic, arabic, or faux hebrew looking script particular to this era of painting in Northern Italy.